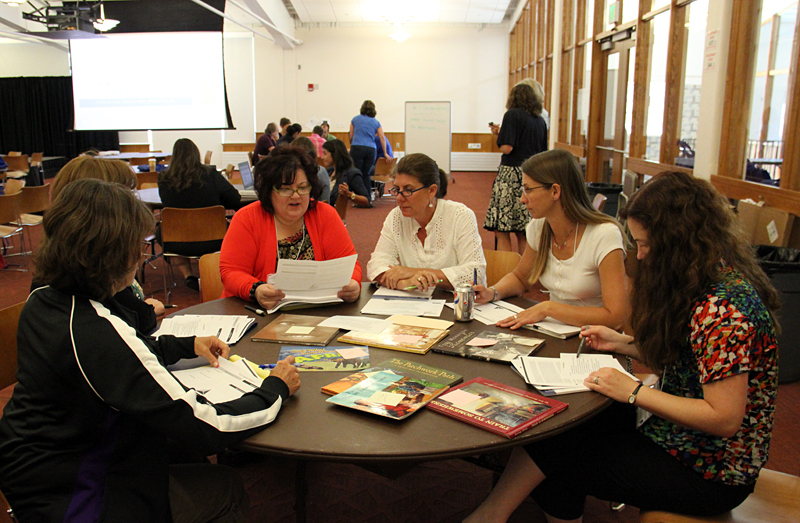 DURANGO, Colo. — On a sunny morning in early June, 30 educators crowded around tables in a room at Fort Lewis College for the first session in a three-day training on Colorado’s new academic standards. Though the school year had just ended, nearly 600 teachers converged on the small college in anticipation of the changes they would face when the new standards rolled out this fall. In the back of the room, six math teachers discussed the day’s first task: to brainstorm what they knew about Common Core State Standards, nationwide grade-level expectations in math and English that Colorado adopted in 2010. “Our district hasn’t touched it at all,” admitted one teacher from western Colorado. Her colleague nodded in agreement. But the two were an anomaly at the table, which mostly included teachers from districts that piloted the standards two years ago. Twenty minutes later, each group taped a large poster to the room’s bank of windows. 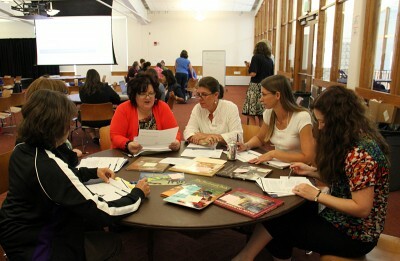 As the two facilitators read each poster out loud, it was clear that at every table, the teachers’ knowledge of the Common Core varied greatly. While some groups had drawn diagrams and written several sentences, others had written just a few words. “We were just coming up with buzzwords,” a teacher called out. In Colorado, the transition has been relatively smooth, if slow, up until this year. Thirteen districts rolled out the new standards early, while at least one district rejected them and created its own comparable ones. The rest of the state’s 180 districts have transitioned more gradually to new standards or continued teaching previous versions of the state’s standards until this year, the deadline for all districts to switch. “We’re going to find out a lot about the readiness of schools and districts—and where they thought they were, and where they really are. This is going to be a heavy lift over the next few years.” –Brian Sevier, director of standards and instructional support for the Colorado Department of Education. Even in the districts that have experimented with the new standards since 2011 and received extensive support from nonprofits like the Colorado Legacy Foundation, progress has varied. In Eagle County, outside of Vail, former superintendent Sandra Smyser said in a May interview that the district’s teachers have embraced the reforms. “It’s difficult for us to find advice on how to proceed because we’re so far ahead,” she said. Despite the delays, the changes have been a long time coming. In 2009, the year before the nationwide Common Core standards were introduced, Colorado released its own new standards for math and English, as well as for less commonly taught subjects like dance and visual arts. An independent review of Colorado’s math and English standards found them to be significantly aligned with the later-released Common Core. But in 2010, the state revised its standards yet again to further integrate the Common Core, while retaining Colorado-specific topics like state history, and standards on financial literacy. As the reforms roll out across Colorado, the biggest impact will be felt inside classrooms, where under Common Core students will learn fewer topics and spend more time on key concepts. Younger students will learn the basics, such as counting to 100 and writing sentences, in earlier grades. Math teachers will move more slowly through mathematical operations to build a better background for higher math, like algebra. Lessons will be steeped in context and modeling real-world scenarios. In one of the more controversial changes, the new English standards promote nonfiction as a way to prepare students for the types of reading they’ll encounter most in college and at work. In elementary school, students are supposed to read a mix of 50 percent literature and 50 percent informational texts, such as speeches and news articles, which will shift to 30 percent literature and 70 percent informational by high school. Not all of the informational reading will happen in English classrooms, but the shift has sparked outcry from some educators concerned that traditional literature like The Great Gatsby will be replaced by nonfiction texts like the Gettysburg Address. The new standards encourage interdisciplinary teaching. For example, the sample curriculum for seventh grade English language arts suggests that students research and write about different perspectives on climate change, a topic typically covered in science classrooms. Common Core also stresses that students use evidence from texts to support their ideas, and that teachers spend less time on “pre-reading” activities such as asking students to make predictions before they read. Teachers are instead encouraged to devote more days to individual texts—one of the architects of Common Core, David Coleman, suggests that teachers spend three days on the 10-sentence Gettysburg speech, for instance—and ask more specific questions about them. But Rael also says it was hard at first to internalize some of the major changes, like reducing pre-reading activities and handing the discussion over to students. She says it took her about a year before she started to alter her lessons and classroom activities dramatically. Now, her students participate in frequent seminars about their reading, during which they moderate their own discussions. They no longer take daily quizzes on various facts from the previous night’s homework. “It really became more of an ‘I gotcha,’ ” Rael admitted. Her new weekly quizzes feature two or three important lines or passages from texts that students must analyze. “There’s a lot of ‘Why? Show me.’ Or, ‘Can you prove that?’ ” she said. At North High School in Denver, which has piloted the new standards since 2011, math teacher Zachary Rowe says the standards have resulted in a “huge shift” in how teachers at his school plan, teach and assess. Instead of listening to lectures and completing practice problems, students participate in group work, projects and debates about math concepts. “We’ve moved away from naked problems—solving for X for the sake of solving for X—and getting into, ‘Why am I learning this?’ ” Rowe explained. As a result, Rowe says his students are more interested in his lessons and eager to talk about, and even debate, mathematical ideas with their peers. Math scores at North High School have risen slightly as well. In the 2011-12 school year, only 10 percent of the school’s ninth-graders scored proficient or advanced on the state math exam. In 2012-13, 14 percent did so. At the same time, new, more challenging math and English tests based on the new standards will debut in Colorado during the 2014-15 school year, and educators are bracing themselves for lower scores. In Kentucky and New York, where scores plummeted after students took new Common Core-aligned exams, opponents of the new standards have seized the opportunity to suggest that the standards are too rigorous. Educators around the state are hopeful, however, that in the long term, the changes will ultimately lead to significant improvements in student achievement.